A delicious, but surprisingly easy recipe that results in a restaurant quality dish. 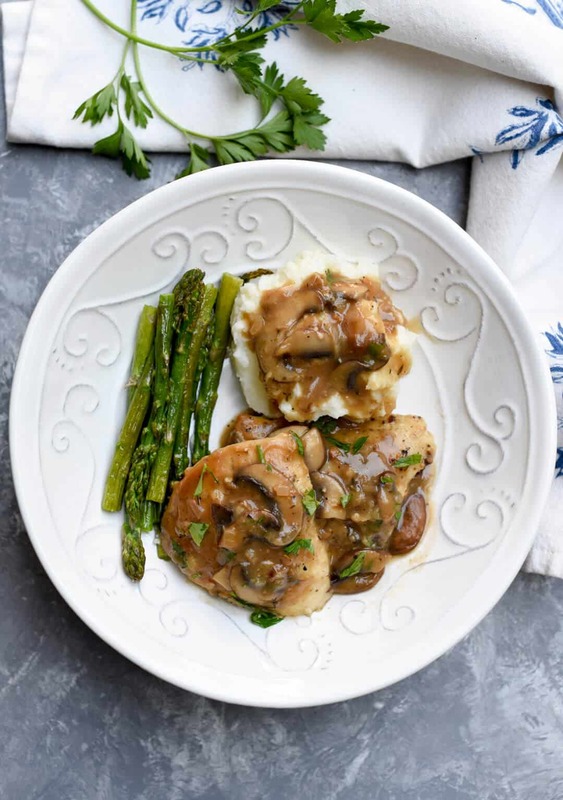 Chicken Marsala is an impressive meal that takes less than 30 minutes to prepare. 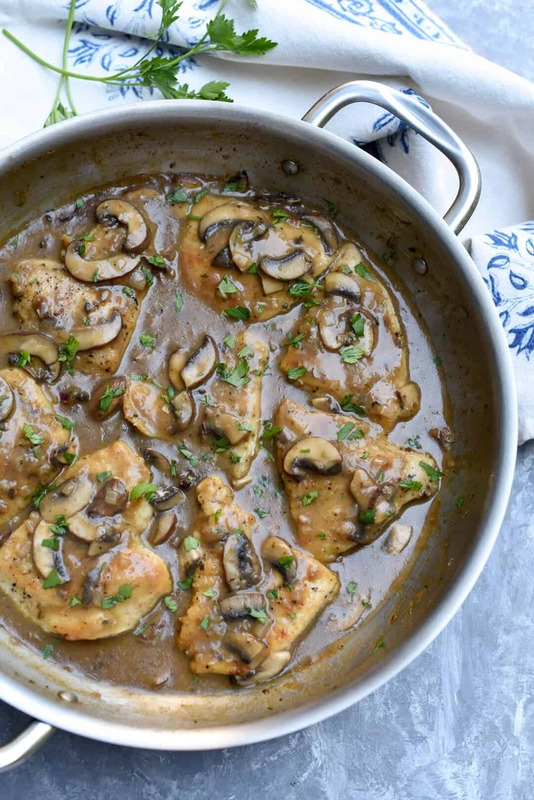 Chicken Marsala is a classic recipe that every home cook should have in their collection. There are few ingredients, it can be pulled together in a flash, and it’s seriously impressive. 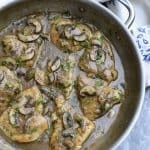 Flour dusted chicken is quickly seared and complemented by a silky Marsala wine sauce studded with mushrooms, shallots and garlic. 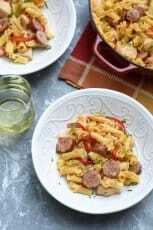 I love to serve it with mashed potatoes but it’s also delicious with cooked pasta or rice. Paul and I took a quick and very spontaneous trip about a week ago. It’s one of the many benefits to being the parents of grown kids that we’re slowly beginning to discover. Very sloooowly. You’d think the minute those kids headed off to college we’d have immediately begun living a more spontaneous life, but no, old habits die hard. There are some other odd things about this grown kids phenomenon as well. One day as I was out running errands, I glanced back into the huge expanse of my now empty SUV and it struck me. Why the heck am I still driving around in this giant vehicle? Years ago it was packed full of water polo players as we drove back and forth to tournaments or with luggage, boys, and dogs, as we headed to the mountains for our annual summer vacation. But now it’s just kind of ridiculous for me to be driving around in this thing. And, for God’s sake, why has it taken me four years for this reality to sink in? And, it’s pretty. And, it has a sun roof that slides open. And, it perfectly suits my new life as a mom of grown kids. We packed our bags and headed to the Sierra Mountains in my pretty, somewhat sporty, but still practical car, and had a fabulously fun and relaxing three days with other grown ups. No kids, no dogs, just us. Same location, completely different experience. I think I’m beginning to get a handle on this thing. We ate most of our meals at restaurants, something that people with grown kids do. One night we sat on the deck at Cuccia’s, an Italian restaurant in one of the most peaceful, beautiful settings imaginable. Big trees, gorgeous sky, mountains all around. I ordered the Chicken Marsala and we shared a bottle of red with my brother Jim and my sweet sister-in-law, Gale, who are blessed to live in this beautiful place. It was pretty awesome. Marsala is a fortified wine which means that a distilled spirit, like brandy, has been added. 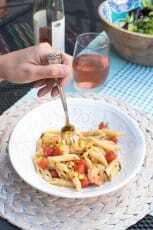 The same is true for both Madeira and Sherry, other popular cooking wines. One great thing about fortified wines is their long shelf life. Some like to refrigerate their re-corked, open bottles but I store mine in my cool, dark pantry and it stays well for many months. Marsala is also quite inexpensive and widely available in the liquor section of most grocery stores. Play with the seasonings. If you prefer rosemary or sage, either can be substituted for the thyme. Or you can leave the thyme out altogether and the dish will still be delicious. Right there with you enjoying life with grown children! Did you use dry or sweet Marsala? The sweet is usually used in desserts but some recipes call for it in chicken Marsala. Looks delicious! Hi Karen! I believe most recipes call for dry Marsala although I’ve seen them with sweet as well. I use Gambarelli & Davitto Private Stock which is the brand available at my local grocery store. It is not labeled as either sweet or dry. It’s very affordable and I’ve had really good results with it. If I had to choose though, I’d most likely go with a dry Marsala for this recipe. Oh yes, I went through that phase as well. Sunroof and all! The best part of having adult children is sharing great food and wine with them! Then, comes the first grand baby! 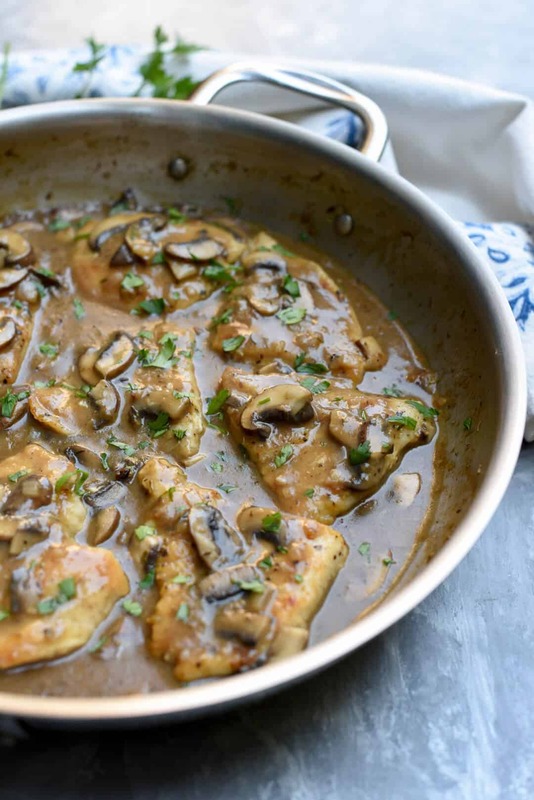 Your chicken Marsala is beautiful. This recipe looks awesome. However, for personal reasons, we don’t drink or cook with any type of alcohol. 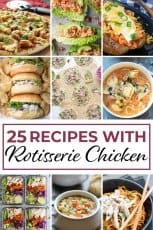 How would this recipe be using all chicken broth or stock? Or what could we replace the marsala with that would give us a similar taste? Thank you. Did you ever get an answer to your question. I don’t cook with wine either so I would like to know what to substitute for the wine. The main flavor component in Chicken Marsala is the Marsala wine so I wouldn’t recommend omitting or replacing it all with chicken broth. I think the outcome would be very bland. Instead I’d be inclined to suggest a different recipe like maybe a Chicken Picatta or something similar that does not involve alcohol. I add sliced green pepper,or red. Hi Carole. 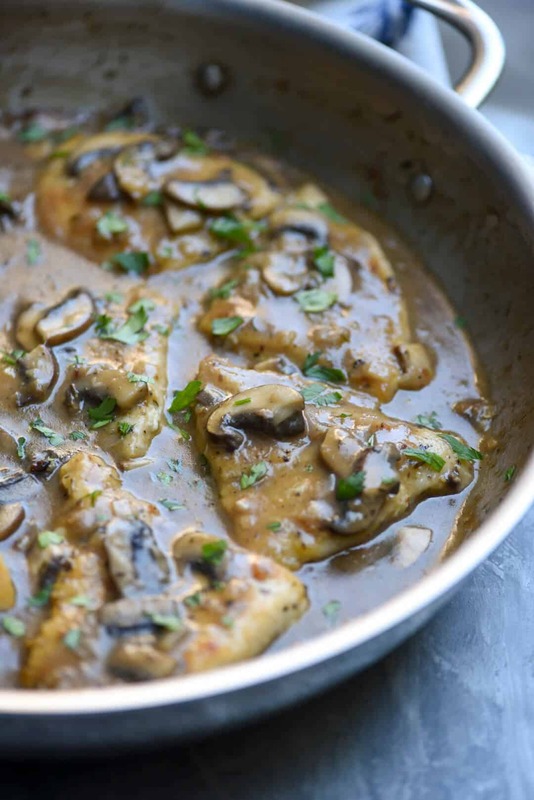 Marsala has a very distinctive taste so although you could replace it, you’d end up with a completely different dish. That being said, you could try using a dry white wine with a splash of brandy. It is available here in Canada – LCBO liquor stores. They have both the sweet and dry. Definitely go with dry with this recipe. The dry I used was ‘Sperone’ Fine I.P. Dry. 750mL bottle. There is, without doubt, Marsala wine in Canada. Any LCBO should carry it. Do you have a good Marsala wine brand you can recommend please? The ones I’ve tried tasted horrible. Do I have to use Marsala or can I just use cooking white wine from the super market? Marsala has a totally different flavor, more like brandy. This recipe is very mouthwatering and also looks very tasty. I would love to try it for weekend dinner. Keep sharing such delicious nonveg recipes. Very good and straightforward. Thanks for posting! You can get it AT many llcbo stores. 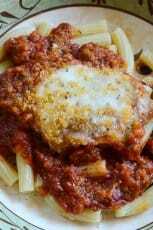 I served this with the Almond Rice Pilaf recipe which complemented the Chicken Marsala perfectly. I love to do this with the Almond Rice Pilaf too. Perfect combo! 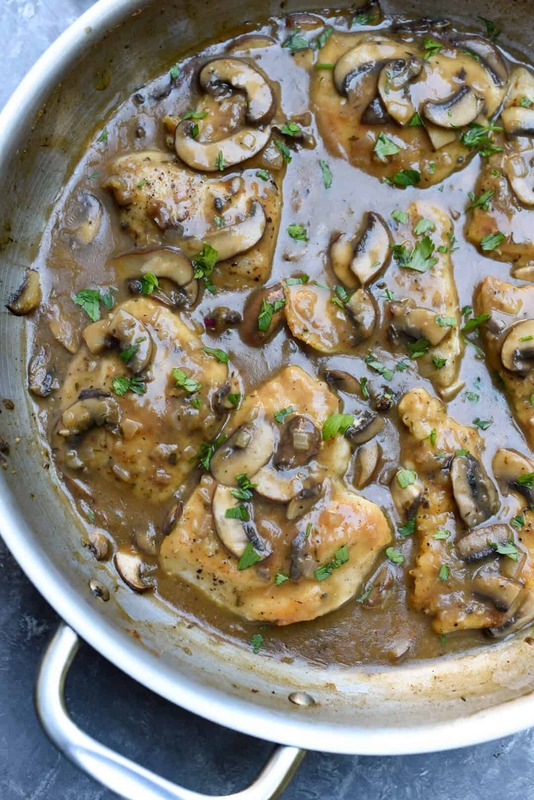 Thanks so much for the delicious chicken marsala recipe. The only sub I made was Madeira instead of marsala. It’s what I had. Easy instructions and great ingredients. Next time I would use a little less thyme. I made it with mashed potatoes with butter and sour cream. What a great dish. Thanks you.so.mich for posting. Definitely trying this this week. My husband hasn’t had a drink in thirty years but I do use wines when cooking. Can’t wait to try this. Was surprised there wasn’t an egg wash step like I w/francaise.